Bamboo Sheets VS Egyptian Cotton: Which Is Better? When discussing sleep quality, bedding is often overlooked as a factor. Little did you know that it contributes to creating a sleep environment that could potentially make or break your slumber. This is why some can compare sleeping in hotels to heaven because these establishments invest in higher quality bed sheets ensuring your snug and cozy sleep. Choosing the right bed sheets, then, becomes an arduous challenge. With the multitude of choices available in the market, we're set to find out which one comes out as the best sheets? In today's trends, bamboo sheets have become the talk of the town and now, people are wondering whether or not it lives up to its hype especially when pitted against the trusted and traditional cotton bedding. Here, we'll compare the bamboo sheets to its premium cotton counterpart, the Egyptian cotton. These bed sheets are made from its namesake, the fibres of the bamboo plant. Due to the sheer length of the bamboo fibres, long and thin threads could be spun from it allowing more space for the thread to be woven together essentially increasing its thread count. Unlike cotton, however, thread count weighs less in the softness and overall quality of bamboo sheets because even with a low thread count, bamboo bedding continues to provide the luxurious feel that people look for in their sheets. What are Egyptian cotton sheets? Egyptian cotton, on the other hand, is known for serving the highest quality and the most durable amongst its cotton counterparts. Handpicked, the Egyptian cotton plant produces long threads with the smallest diameter possible. The thin yarn enables the manufacturers to create material with a high thread count that never sacrifices strength and softness. This is where the well-known rule-of-thumb comes in where the higher the thread count, the better the quality of the sheets. In this battle between the sheets, we'll look into five different criteria to see which bedding is the best match for you. Both bamboo and Egyptian cotton sheets are known for its high quality. These sheets have been known to last for up to 15 years because of the long fibres present in both the bamboo and cotton plant. Instead of sewing small patches of fabric together, bamboo and Egyptian cotton sheets are made out of long and thin threads that stretch throughout its entirety covering the whole length of the sheet. This method allows the bedding to resist pilling and tearing — both of which shorten the sheets' life. However, with great power comes great responsibility. Both beddings require lots of care particularly when washing. Gentle cycles are a must to uphold the bedding's quality. Tip: To be able to maximise its lifespan, make sure to take note of the care instructions that go with your sheets. One difference that the two sheets have is that cotton is more likely to discolour because it absorbs sweat and oil from our body while you're asleep. These yellow and gray stains in our sheets could be countered with deep cleaning but some opt to throw it away after discolouration for sanitary reasons. Bamboo bed sheets have a silky feel to them but unlike silk, the material isn't slippery at all. It is naturally light and breathable especially because of its moisture wicking capabilities. This means that even in the hottest of temperatures, the bamboo fabric will not stick to the skin similar to working out in a dri-fit shirt. It also has temperature regulating features which enables it to keep you warm in the winter but cool in the summer. Egyptian cotton bedding, especially those with a higher thread count, have a remarkably soft and luxurious feel to it. Like fine wine, the longer you have your Egyptian cotton sheets, the softer it gets because washing it makes it softer than ever. 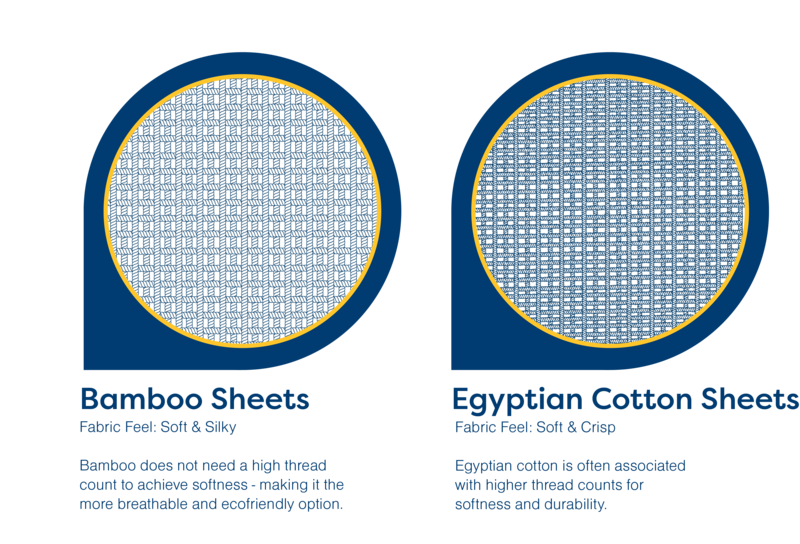 Unlike regular cotton varieties, Egyptian cotton is breathable making it thin and lightweight. Tip: For maximum softness, pick Egyptian cotton sheets with a minimum thread count of 400 or bamboo sheets with a minimum of 200. One aspect that draws a number of people to bamboo sheets is the fact that it is hypoallergenic, perfect if you have sensitive skin. Its aforementioned moisture wicking ability also prevents the growth of bacteria in your bedding which in turn, prevents odor from clinging to your sheets. Not only that but it makes sure that you're not sharing your bed with anyone — or anything — else because it keeps bugs, dust mites, and pathogens away from your bed. While bamboo sheets bring in a variety of health benefits, cotton sheets aren't known to have any. Egyptian cotton sheets, however, are known to be gentle to the skin which also makes it suitable for people with sensitive skin. Made from the bamboo plant, bamboo bedding products are said to be sustainable seeing that it grows rapidly with little to no aid from pesticides and other agricultural chemicals. To make sure that negative effects from chemicals don’t affect your health, it is still recommended to choose sheets that are made from organic bamboo. On the contrary, cotton is a plant that uses extensive amounts of pesticide and harmful chemicals. If you are environmentally conscious, this doesn't mean Egyptian cotton sheets aren't for you. Alternatively, you can opt for some bedding options that are made of organic cotton. From affordable prices to luxurious price tags, both bamboo and Egyptian cotton bedding have a broad price range but in the end, it really depends on what you need in terms of features and comfort. The most common in the market are blend sheets — a combination of different materials. Although more expensive, getting 100% bamboo or 100% Egyptian cotton is crucial to make sure you reap all the benefits that the sheets provide. If you're on a budget, picking a 100% bamboo sheets with a low thread count is an alternative. Like mentioned earlier, with bamboo beddings, thread count doesn't matter as much to the quality and softness delivered by these products. When it comes to softness, the battle seems like a tie but when all other factors come in, bamboo sheets are the clear winner. From its cooling factor to its health and sanitation benefits to its long life, you definitely get your money’s worth out of these sheets!